GPU mining can still be profitable and how to cool your rigs during the hot summer months? People can still make money mining cryptocoin with GPUs, so don’t just sell your GPUs on ebay just yet. Yes scrypt asic is coming out from KNC and many other manufacturer, so yes eventually asic will take over the scrypt mining hardware, while GPU will not longer be profitable! That is true! But! as you know there are development of newer scrypt algo to be immune to asic such as scrypt-n and many others are currently being developed. Currently the most popular one are probably scrypt-n vertcoin, prediction from many says that it will rise once KNC scrypt and many other asic manufacturer ship their equipment, at that time GPU will be no longer be feasible or profitable mining straight scrypt, so with many people already know scrypt-n and other scrypt algo exist, they will switch. Scrypt-N vertcoin for example is going up, and sometime beat scrypt coins based on coinwarz.com and IRC chat room vertcoin. 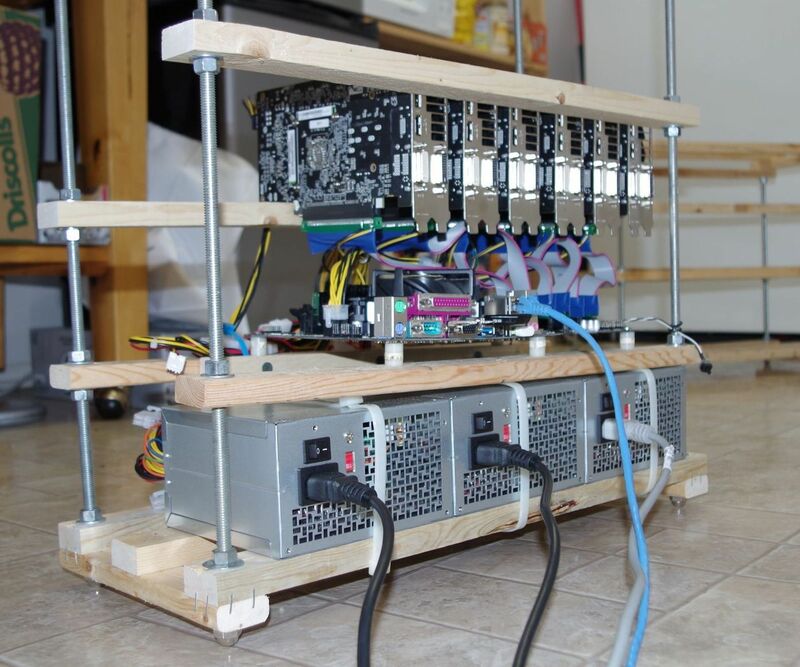 Below is a mining rig that is cheap to build, and very effective in cooling. On top of that space saving with nuts bolts washers and thread rods and cheap wood, turn your computer into a mining rig.